If you are not quite sure how to effectively use EQ, I promise, you are not alone. EQ may seem like a simple concept, but as you may have found, it is quite the task to get it just right. But, before we get into how to use your mixer’s EQ, let’s first go over the most important concept when it comes it comes to EQ. Focus on cutting frequencies, not boosting them. The first EQ knob on your mixer is for high frequencies. You may find yourself reaching for this knob when you hear something harsh that needs to be cut, but this is not the right response and let me tell you why. Harshness is generally around the 1k frequency range. When you try to cut this out with the high frequency knob, you also cut out all the frequencies that bring clarity and brilliance to the sound. There is no reason to give these things up if you don’t have to. I tend to leave the high frequency knob in it’s default position, 12 o’clock. I have not found very many applications where you would actually want to use this knob. Of course, don’t be afraid to experiment with it, but again, use it as a last resort instead of the first. 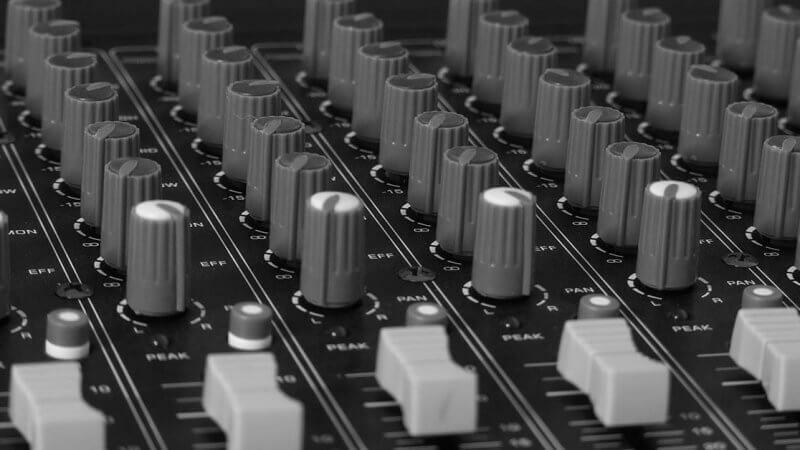 Most mixers have two knobs to help you control mid frequencies. One knob controls the level of the frequency whereas the other knob lets you choose the exact frequency range you are cutting or boosting. You will probably have to expand your thinking around these two knobs because they not only allow you to adjust mid frequencies, but also what you would consider to be high and low frequencies as well. These two knobs should be your first step when fixing a frequency problem. To start things off, turn the level knob up significantly. Now, use the frequency knob to sweep through the frequency spectrum and find which range of frequencies is louder than the others. Now, use the level knob to cut the troublesome frequency range until you get the desired sound. There are times when more than one frequency range is causing the problem. Unfortunately, your mixer’s EQ will only allow you to fix one, so choose the biggest problem. If more EQ is needed, you will need to connect an external EQ processor, which will allow much greater flexibility than what you mixer as to offer. The low frequency knob allows you to adjust those super-low frequencies – mainly the ones that flow through subwoofers. The main use for this knob is to cut the lows out of vocals. There is really nothing pretty about letting this frequency range come through on a vocal, so you might as well take quite a bit out. You will then notice that the vocal becomes more clear and the instruments are allowed to shine in that frequency range. On most mixers, at the very top is a button for the high pass filter. When this button is engaged, it will cut out the super-low frequencies, usually those under 100Hz. This should always be engaged on vocals and also comes in handy for instruments that do not need to be in this space, such as the electric guitar. Now, be sure this button is not engaged on the bass guitar or kick drum. Otherwise, they will sound quite wimpy. Thanks for the write-up! We’re a little church in STL that uses an analog Soundcraft board. It works pretty well for us, and this article will help the all-volunteer Sound Team to know their sound board. Thank you! We been having issues with the bass sounding weak in the subwoofers but after reading this I need to correct the lows in everything else. Other words I have the Low Frequency Knob set at 1 o clock for vocals and acoustic guitars and piano!